The year 1954 stands out as an epochal one in the history of the SOCIETA’ VITTORIA ITALIANA DI MUTUO SOCCORSO. The long cherished dreams of the membership of this lodge are culminated in the dedication of our lodge building today. 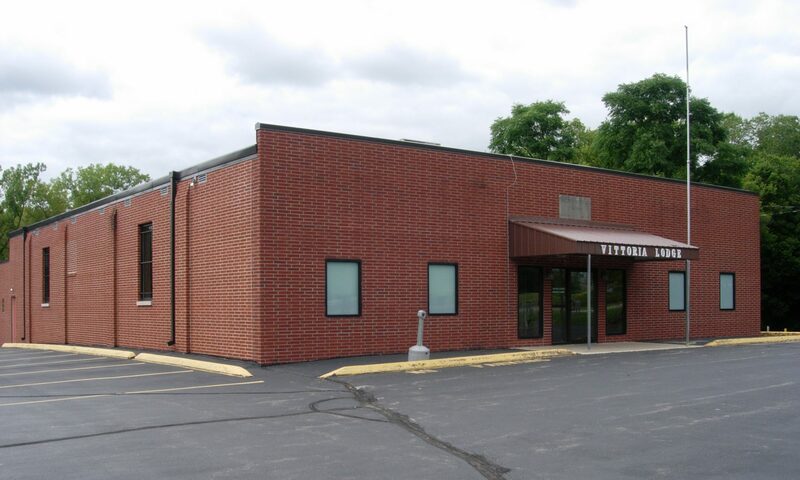 The history of our lodge is closely related to the history of the migration of Italians from Italy to the mining camps of Polk, Dallas, Boone, Marion and Lucas Counties in Iowa. Our lodge traces its origin to the Court Romana No. 49 of the Order of Foresters of America which was founded on March 11, 1911. On December 1, 1913, the Court Romana and the Court Emiliana No. 50 (also of the Order of the Foresters of America) separated themselves from the latter order and were legally incorporated under the present name of our Lodge: SOCIETA’ VITTORIA ITALIANA DI MUTUO SOCCORSO. The original incorporators and first officers were: Pellegrino Castelli, president-general; Angelo Silvestri, vice-president; Valente Logli, treasurer; Angelo Lenzotti, financial secretary; Domenic Piagentini, vice secretary and Domenic Matteucci, doorkeeper. To these men we owe much for having planted the seed, which today is one of the oustanding American-Italian organizations in the State of Iowa. 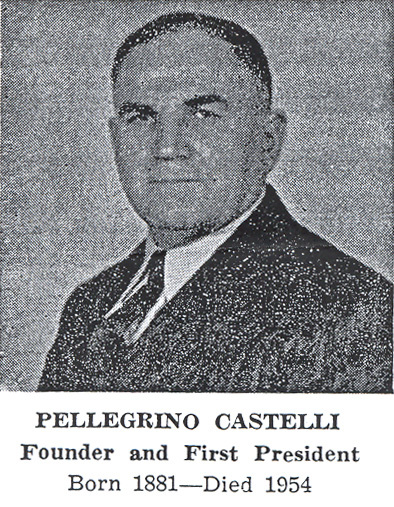 Pellegrino Castelli, our first president, passed away on February 5, 1954, in Highwood, Illinois. Although unable to attend our meetings for many years, he at all times remained a true, loyal and honored member. At his death he was honorary president. It was through his indefatigable efforts that the lodge mushroomed into an organization with a Supreme Lodge at Carney, Iowa and Subordinate Lodges at Madrid and Melcher, Iowa. Meetings of the Supreme Lodge were originally held in Carney, Iowa, because this was the center of the membership population. Later, in 1918, the meetings were transferred to the IOOF Hall in Ankeny, Iowa. They were held there until 1934, when meetings were transferred to the IOOF Hall in Des Moines, Iowa. Since January of 1954 the lodge membership has met in the new lodge hall. Due to the fact that many of the members from Madrid, Granger, Melcher and Williamson, Iowa found it difficult to attend meetings, subordinate groups were organized at Madrid and Melcher. The Melcher Lodge merged with the Supreme Lodge in 1940 and the Madrid Lodge was merged with the Supreme Lodge effective with the annual meeting held on June 20, 1954. The lodge has, throughout the years of its existance, had as its principal purpose “to unite fraternally men of Italian extraction, of good moral character.” Once an individual became a member of our lodge, we at all times dedicated ourselves to the best interest of that member, and of his family. The importance of our lodge cannot be over-emphasized. It was organized at a time when Italian migration to the United States was especially heavy. Besides serving as a health benefit organization, it also became a vital instrument in the social life of the new immigrants and their families. The dedication of our new edifice marks a new milestone in our history. With this new building we not only hope to be able to better serve our membership but also to be able to be able to play a more important part in the life of our Community, State and Nation. The importance of having our own lodge building has never been overlooked, but the personal welfare of each member was of first importance. It was not until 1949 that the lodge membership felt itself strong enough to embark on a program which would ultimately end with the dedication of our own building. In that year a Land Committee was appointed, consisting of the following members: Rex Fontanini, Pete Plemone and Domenic Fontanini. After investigating various sites in Polk County, the lodge purchased a 13-acre tract. This tract was selected because it offered opportunities to provide for the varied interest of the members of the lodge. It is a rolling tract with excellent picnic grounds. 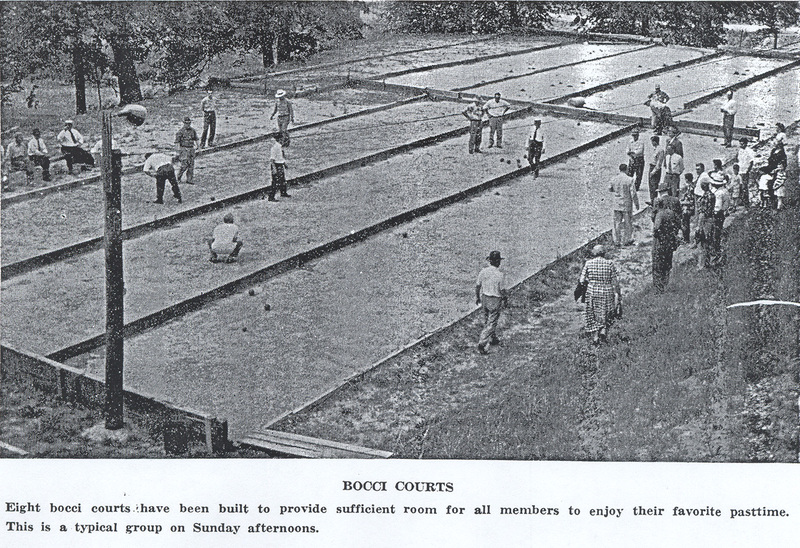 It also enabled the lodge with a minimum of expense to build eight bocci courts for the use of its members. Finally, it offered an excellent location for the erection of our building with an abundance of surrounding parking space. Since its purchase, the area has provided a place where our members meet on Sunday afternoons for friendly games of bocci. Playground equipment is available for the children and croquet for the women. With the new building we anticipate regular get-togethers for members and their families. It is difficult to place special praise on any given member in an organization like ours where so many have dedicated themselves to the continued best interest of the lodge and its membership. Besides Pietro Castelli, other presidents who have contributed much to the growth of the lodge have been Germano Pagliai, now deceased, of Madrid, Iowa. To him we owe our new and revised constitution and many of the provisions therein which have materially aided in the growth of the membership. During the administration of Pete Plemone, who served during the war period, the lodge has its most important financial growth. Amedeo Rossi, now orator, deserves special praise in that he offered the spark which ignited the imagination of the membership to definitely embark on a building program. It was Rossi who offered to make available the necessary financing if no other means were available. At this point the membership embarked on a pledge program among its own members which provided, with the assistance of lodge funds, the funds necessary to pay for the present building. The list of other members who have played an important part in our organization is long and demonstrates their loyalty to a cause. Among the older members this list includes such men as: John Bertogli, Domenic Fontanini, Sam Gioffredi, Angelo Lamberti, Frank Ghitali, James Fontana, Pete Fontanini, Sesto Fiori, Joe Righi, Joe Betti, Gaspero Vignaroli, Sam Ballantini, John Butelli, Biagio Medici, Adolfo Balducchi, Valente Logli, Dominic Lolli, Valerio Zagnoli, Oswaldo Nizzi, Louis R. Fontanini, James Medici, Ermido Cerretti, Primo Rossi and scores of others whose names will forever be remembered by all of us. The cooperation shown by all of the members in the past is assurance of a brighter future in the years to come.